After their 12-0 loss to New Zealand, Papua New Guinea are holding their chins high as they prepare for the second day of the OFC U-19 Women’s Championship 2017 at Ngahue Reserve in Auckland tomorrow. Disappointed with the result but proud of her team’s effort, Papua New Guinea coach Rachel Wadunah is expecting an improved performance in their clash with New Caledonia now that the nerves from facing the defending champions first-up are behind them. “They did the best they could, despite conceding goals. They played until the last minute,” she said. Sitting third on the table after a narrow 1-0 victory over Samoa, another win for New Caledonia could move them up to at least second place, but coach Kamali Fitialeata is expecting Papua New Guinea to leave nothing on the field. “I hope that we can take advantage of Papua New Guinea having lost their first match, but we also know that a team that gets wounded like that can be even more dangerous for us,” he said. Opening the second day of action, a top-of-the-table clash between New Zealand and Fiji could see the debutants steal the lead, but Fiji coach Saroj Kumar is well-aware of the immense challenge ahead of them. “We will try to hold them out as much as we can,” he said. Despite a slow first half against Papua New Guinea, New Zealand coach Gareth Turnbull is feeling positive heading into their Fiji clash, but knows the Melanesians will be quick to pick up on any errors from his side. “We played Fiji at the OFC U-17 Women’s Championship last year so we expect a lot of those girls will be here and have had international experience,” he said. “They’ll be organised and they’ll have a plan and if we don’t adhere to what we want to do – at a speed that’s quicker than they can wrap – then we’ll create troubles for ourselves. The final match of the day will see both Tonga and Samoa fighting for their first points of the competition and although Samoa has proven their ability in the past – placing second in the 2015 edition of the competition – coach Martin Tamasese is expecting a neck-and-neck battle against their Polynesian neighbours. “We’re well-prepared for all the matches we have to play and I know the next one against Tonga is going to be a hard one for us,” he said. After an upsetting loss to debutants Fiji, Tonga coach Christian Koaneti has had his full focus on fixing weaknesses in his side and is feeling positive about finding the net in their match against Samoa. “Fiji was technically superior to us. We tried to play according to what we planned, but it didn’t turn out that way,” he said. “I’m taking the loss to Fiji as something that helped us see where we needed to improve for the next game with Samoa. Vital Statistics: Fiji sit on equal points with New Zealand after both teams secured strong wins in their first matches but with eight goals separating the two nations, a win against the defending champions will be crucial for Fiji’s France 2018 qualification campaign. The Players: Captain Luisa Tamanitoakula proved her scoring ability in Fiji’s opening match against Tonga, finding the net during injury time in the first half when she connected her head to a corner, then adding to her tally from the penalty spot in the second half. Tamanutoakula’s strength on the ball and all-or-nothing attitude up front makes her an intimidating attacker against any backline. Fiji: 1. Ateca TUWAI (GK), 2. Cecelia NAINIMA, 3. Mereoni TORA, 4. Sekola WAQANIDROLA, 5. Veniana RANADI, 6. Ledua SENISEA, 7. Koleta LIKUCULACULA, 8. Timaima VUNIYAYAWA, 9. Asenaca DIRANUVE, 10. Luisa TAMANITOAKULA, 11. Cema NASAU, 12. Silina QARAWAQA, 13. Louisa SIMMONS, 14. Miriama BAKANICEVA, 15. Maca RALAGI, 16. Aliza HUSSEIN, 17. Miliana BUREITAU, 18. Cynthia DUTT, 19. Laca TIKOSAYA, 20. Maria PARR (GK). 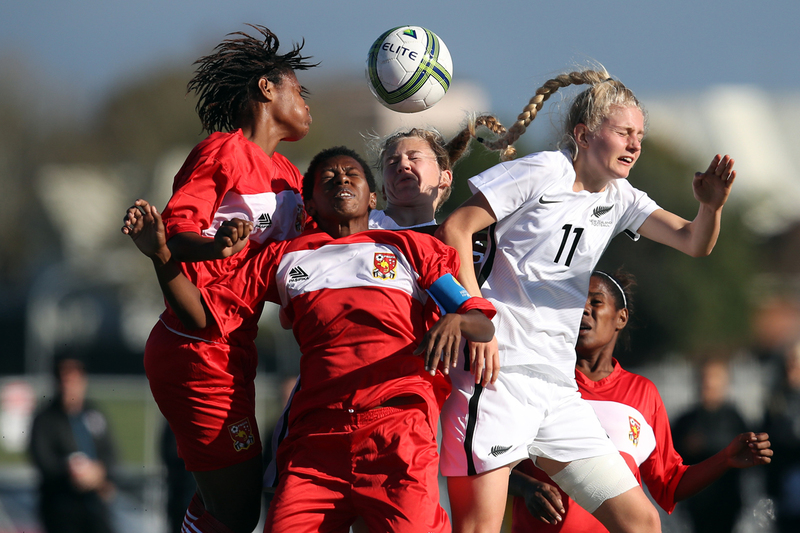 Vital Statistics: New Zealand have never faced Fiji in this age-group but many players from both teams faced each other in last year’s OFC U-17 Women’s Championship. After a dominant 11-0 win over Fiji – who were making their debut in the U-17 competition – New Zealand will be feeling confident ahead of their meeting with the U-19 side this Friday. The Players: Substitute Dayna Stevens proved her worth in New Zealand’s opening match against Papua New Guinea, finding the net three times after taking the field in the 49th minute. The attacker’s vision for the game and creative combinations with teammates allows Stevens to position herself perfectly and make an international goal appear effortless. New Zealand: 1. Anna LEAT (GK), 2. Saskia VOSPER, 3. Rebecca LAKE, 4. Elizabeth ANTON, 5. Sarah MORTON, 6. Grace JALE, 7. Emma MAIN, 8. Malia STEINMETZ, 9. Samantha TAWHARU, 10. Hannah BLAKE, 11. Jacqui HAND, 12. Emma CLARKE, 13. Nadia OLLA (GK), 14. Claudia BUNGE, 15. Michaela FOSTER, 16. Nicole METTAM, 17. Dayna STEVENS, 18. Alosi BLOOMFIELD, 19. Deven JACKSON, 20. Serena MURRIHY. Vital Statistics: Papua New Guinea currently sit at the bottom of the table on goal difference but with Samoa and Tonga’s losses in match day one, a win against New Caledonia would be enough to move Papua New Guinea at least one place up the table. The Players: The goal margin against New Zealand could have been much higher without captain Margret Joseph cleaning up in the backline. Joseph denied several attempts, the most impressive in the 60th minute when goalkeeper Faith Kasiray was beaten and Joseph sprinted to the goal and managed to clear the ball from the line. Joseph’s speed, strength and leadership will create a tough challenge for New Caledonia’s strikers. Papua New Guinea: 1. Faith KASIRAY (GK), 2. Natasha SAGEM, 3. Margret JOSEPH, 4. Isabella NATERA, 5. Bridget PAIME, 7. Marity SEP, 8. Alison PAULIAS, 9. Selina UNAMBA, 10. Nicollete AGEVA, 12. Belinda GIADA, 13. Ramona PADIO, 14. Leah KARO, 16. Serah TAMGOL, 17. Melisa JOFARI, 18. Jacklyn MAIYOSI, 19. Gorethy PAOFA, 20. Amatha MISTERA. Vital Statistics: New Caledonia have never faced Papua New Guinea in this age group but the two nations did meet in the semi-final of last year’s U-17 competition in the Cook Islands. Papua New Guinea scraped through to the final with a 2-1 win after a scoring in the 5th minute of injury time in the second half. The Players: Océane Forest was a key player in New Caledonia’s match against Samoa. Although Forest was unable to convert her several close attempts at goal, the high-pressing defender was behind the cross that Alice Wenessia connected with to score the single goal of the match. Forest’s strength in defence and accuracy in attack makes her an all-rounder on the field for New Caledonia. New Caledonia: 1. Karine XOZAME (GK), 2. Darnelle HACE, 3. Joséphine SAKILIA, 4. Ami-Nata AJAPUHNYA, 5. Sonia HNANGANYAN, 6. Isabelle ILENGO, 7. Océane FOREST, 8. Shaya IHMELING, 9. Alice WENESSIA, 10. Marie-Laure PALENE, 11. Jeanine HUMUNIE,12. Johana TAKAMATSU, 13. Ivonne XOWI, 14. Cassidy CAWA, 15. Valérie HOLUE, 16. Donatienne BALY, 17. Moïsette BROUSTET, 18. Isabelle HNAWEONGO, 19. Marie WANEUX, 20. Kathleen WAUNIE (GK). Vital Statistics: Samoa and Tonga last met in the 2015 edition of the competition, which was played in the same round-robin structure. Although Samoa finished second and Tonga finished last, the two Polynesian nations were inseparable when they met on the field, drawing 3-3. The Players: Tianna Sekona was a tireless force up front in Samoa’s first match against New Caledonia, chasing every through ball and causing trouble in the Francophone’s backline. Sekona was unfortunate not to find the net, denied several times by impressive saves from New Caledonia goalkeeper Karine Xozame. Samoa: 1. Katarina AH SUI (GK), 2. Renee ATONIO, 3. Hunter MALAKI, 4. Epi TAFILI, 5. Mariecamilla AH KI, 6. Sonya TANUVASA, 7. Rachael TAGATAULI, 8. Liana SOIFUA, 9. Tianna SEKONA, 10. Shalom FISO, 11. Matalena FASSAVALU, 12. Talaiesea MULITALO, 13. Mole SAOFAIGA, 14. Emele PALETASALA, 15. Natiflo PEREIRA, 16. Conzuella VATU, 17. Vineta FALEAANA, 18. Jecky TOMA (GK). Vital Statistics: Although Tonga currently sit second-to-bottom on the table, a win for could potentially see them move all the way to second-to-top if results from other games fall in their favour. The Players: Mele Akolo put in a valiant effort between the posts for Samoa in their last clash against Fiji, conceding only once in normal play. The other three goals came from two well-executed penalties and a difficult corner. Throughout the 90 minutes, Akolo denied several attempts from their Melanesian opponents and came out of her box often to support the backline. Tonga: 1. Mele AKOLO (GK), 2. Fifi MOALA, 3. Michelle TUITUPOU, 4. Meleseini TUFUI, 5. Manusiu LATAVAO, 6. Siunipa TALASINGA, 7. Seini LUTU, 8. Halaunga TAHOLO, 9. Carmel UHILA, 10. Teisa FUSI, 11. Mele KAFA, 12. Ofa ATAONGO, 13. Peta FENUKITAU, 14. Patricia LIKILIKI, 15. Luseane VIVILI, 16. Katalina TALIAULI, 17. Kalolaine TALIAULI, 18. Sosefina HAVEA, 19. Alexandra FIFITA, 20. Adrienne TAHITUA (GK).